St. Patrick’s Day is around the corner, and even if you don’t have an Irish bone in your body, it can still be fun to celebrate. I have found this to be true, especially now that I have kids. If you are looking for a fun, easy St. Patrick’s Day treat to make with your kids (or to send in for a school party, work party or any St. Patrick’s Day party! 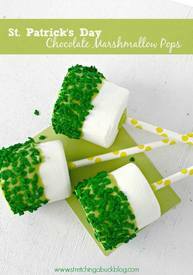 ), be sure to check out these St. Patrick’s Day Chocolate Marshmallow Pops.